The very fact that Alex has maintained itself as a 40mph Tropical Storm over the Yucatan of Mexico tells me several things. 1) It’s a now well-formed system. 2) It’s embedded within a near perfect atmospheric environment with minimal windshear. 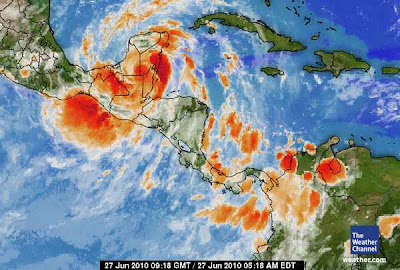 3) It’s over 50% likely that once it enters the southwestern Gulf of Mexico that it will become a hurricane. Waters are plenty warm in the southwest Gulf and with a good atmosphere over this region for the near future suggests this system will become the Atlantic’s first hurricane. Does it have time to grow beyond cat 1 intensity? Well not likely as of this time, however if it were to track slightly further northward once in the Gulf and perhaps threatens extreme southern Texas, then there is a small chance for further intensification as well as organisation as waters are warmer further into the Gulf and to deeper depths. Also and more importantly, it would have longer over those warm waters which would provide adiquate time to strengthen. 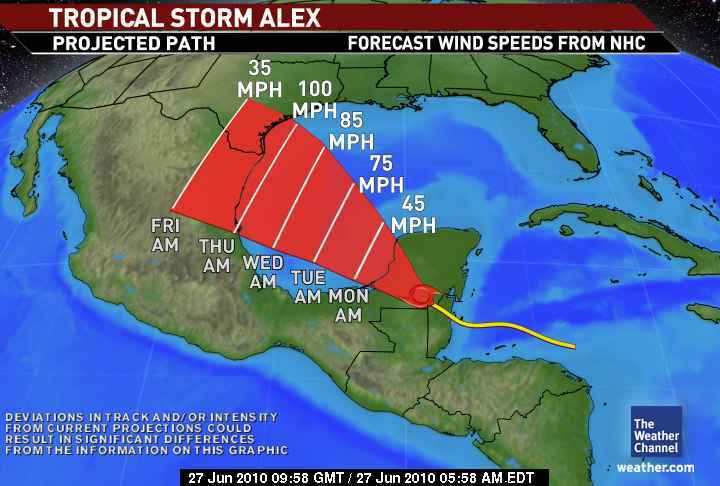 As of this moment, it appears that the upper-level ridge will dominate the atmosphere over the northern and central Gulf and therefore will push Alex onto the eastern coastline of Mexico, sometime Wednesday or even Thursday… If it happened to be Thursday before landfall, this again may allow Alex to grow into a category 2 storm before impacting population, perhaps around Tampico. Stay tuned fore further updates on Alex coming later today. 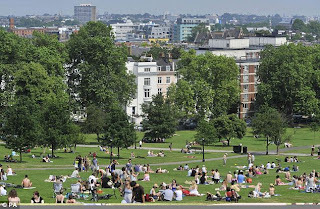 As of 9am GMT, Sunday, it was an already balmy 72 degrees (22C) at Charlwood in Surrey and after the same location within Greater London just fell shy of the UK’s warmest reading so far of 2010 which was 84 degrees at Heathrow Airport yesterday with a high Saturday of 83 degree (28.6C) reading, it looks set that somewhere within the Greater London area will see the warmest reading of the year so far, today with Mark Vogan predicting a high of 88-90 degrees (31-32C) between 3-5pm GMT. It’s all about a “building of heat” which has been the case since Thursday, gradual warming often sees a “peaking in daytime highs” which is likely today (Sunday). When conditions are right and high pressure stands strong in one given area, highs gradually warm day after day and more importantly, nights fail to cool. When you’ve reached that threshold of minimal nighttime cooling, that allows the day to start off warmer than the previous, so a warmer base allows that rising sun to heat the air faster and easier. For example, Charlwood’s 9am reading of 72 is the warmest so early in this current warm spell. As that sun rises throughout the morning, the air is ALREADY WARM so it doesn’t take as much work from the sun to further heat the air. When conditions are right, when you look back at the previous day and it’s a degree or two warmer than the same time the previous 24 hours, it’s more than likely the actual peak temperature will be warmer, therefore a good indicator and often for meteorologists a good indicator at just where that high will peak at… that of course is given the winds remain relatively light and there is minimal clouds to abstruct the sun’s rays to the surface. Sometimes a breeze will kick in, often due to heating, or a thunderstorm will blow up, these two factors often prematurely cut off the daytime heating process and therefore the high doesn’t reach the anticipated level. That isn’t likely to be the case. The atmosphere is reasonably “capped” over southern England, therefore cloud formation should’t be an issue. The core of high pressure is fairly closely over southeast England, therefore winds should remain light, thus all indications are that it’s going to reach forecasted levels this afternoon. T-STORMS POSSIBLE FOR NORTHERN ENGLAND AND SCOTLAND TODAY.. Pressures are lower across the north and with a closer distance to an area of LOW pressure to the northwest of Scotland, surface warming this afternoon should still allow 70s for central Scotland, the energy of a frontal boundary across the northwest may spark of afternoon thunderstorms across central Scotland as surface readings warm and helps ignite energy aloft. The increasingly drier soils, particularly over the Lake District but also throughout much of the UK with exceptions of northern and far western Scotland, this is already aiding in strengthening high pressure over us. The dry weather shows no signs of change and as we appreoach the hottest portion of the year, the signs are there for what could be a scorcher of a July and August. 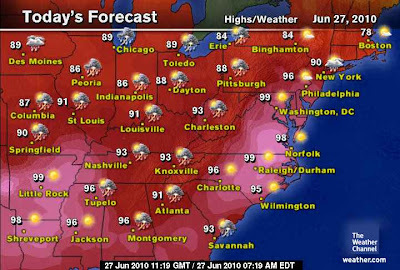 Remember the hottest air of the year during the record sdummer of 2003 didn’t hit until early August! Right now it appears that July will see a much warmer and drier than normal pattern and highs which push into the 90s for the south and 80s for the north. Bermuda High upstoppable across the Eastern States with highs that will rocket into the upper 90s with some 100s likely in North Carolina, Virginia (including Greater Washington DC) and even south Jersey today with warmest night of 2010 ahead tonight, Lows will likely fail to drop below 80 degrees from Downtown Washington, Baltimore, Philadelphia and possibly even up to New York City. Coastal North Carolina, Virginia and Delaware may see lows only drop to 81-84 degrees, where coastal waters of the Atlantic as well as coastal inlets and bays have water temps now into the middle 80s. Your Sunday will be dominated by highs in the 90s for basically everywhere, only exception will be in the west, no it won’t be cooler, no, it will in fact be hotter! Area of northwest Louisiana into Texas will once again broil in near 100 degree heat. As for southern Louisiana, Mississippi, Alabama, Georgia and throughout Florida, it’s all about hit and miss PM storms, dew points in the 70s and indeed low to mid-90 degree heat. Tonight will see 80s into the early morning hours and drop off to around 75-80 degrees by around 4-5am for the morning low. Further north into the interior northeast, highs range from 92 to 94 degrees with a chance, though lower than that of the central and eastern Gulf coast of afternoon storms. Low will range between 71-76 degrees. Yes, you’ve guessed it. a frontal system progresses down through the Northern Plains and into the Lower Midwest later today. Highs will be pleasantly warm behind the front in North Dakota with highs generally in the low 80s. Just ahead of the front the high should warm into the upper 80s for both Minneapolis down to Chicago. 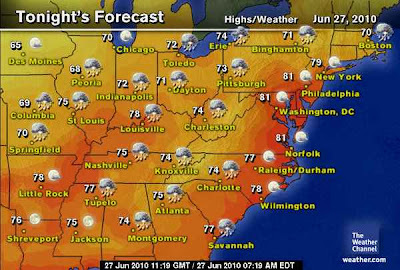 MSP hi should hit 87 and 88 or 89 for Chicago, lower 90s the further south you go towards St Louis. More or less everywhere south and east of North Dkota has a chance of thunderstorms today. Lows range from the upper 60s with drier air to the west, low to mid-70s in the soupier air to the south and east. The entire Western third of the nation looks terrific. Abundant sunshine for everyone. Highs in the 70s and 80s for the Pacific Northwest and interior, east of the mountains. 80s and 90s for the Great Basin and coastal 70s, inland 80s and 90s and 100s for the desert. Highs should top around 100, low around 77 for Vegas. Hi of 107, Lo around 80 for Phoenix and 112, lo 82 for Death Valley. LA should see highs around 75-77 after morning clouds. Storms over the interior Ohio Valley and Mid-Atlantic will oush towards the Atlantic, ahead of this front, the warmth will surge into the Northeast with highs ranging from around 100 for DC and Baltimore, mid-90s for Philly, low 90s for New York and mid to upper 80s for Boston. Those storms will knock on the door tomorrow in these cities. Lows tonight will generally run down to only around 80 degrees for downtown DC, Balt, Phila and New York! Today should see lesser chances of storms nearer the Texas Gulf Coast with highs running into the mid to even upper 90s for Houston as skies are sunnier. Across the heart of Texas highs are knocking on the door of 100 from Lubbock to Dallas. Lows really struggling to get below 75 for most places, some spots may be lucky to hit 80 for a low by tomorrow morning! As seen from today’s run of the ECMWF model, tomorrow shows Alex, the closed “L” which as you can see placxes the system out over the southwest Gulf and aiming northwestwards towards the Tampico area of Mexico east coast. The Southwest blowtorch is on and will expand north up through the Rockies this week perhaps bringing the first 100 for both Denver, Salt Lake and even perhaps Reno and Boise before next weekend. We may also see the firest 120-degree reading in Death Valley also.. Meanwhile the heat is strong today and indeed tomorrow, note the “red” directly over the I-95 corridor tomorrow… Another day running towards 100 will be found between Richmond, Va and Newark, Del and mid-90s for Philadelphia up to La Guardia, NYC. The above model run is for Wednesday and if you notice, another contour line marked within the low representing Alex is there for a mexican landfall, it to me, it looks as though it has a hurricane coming ashore, near or over Tampico, Mexico. Whilst that’s happening, you’ll notice the heat built right up with possibly some of the warmest air over the western Dakotas, 100-105 for Rapid City on Wednesday? Meanwhile, check out the pocket of cooler air drapped over the Northeast, after mid-90s tomorrow as far north as LaGuardia, NYC, it may be mid-80s for highs Wednesday, possibly lower, Boston may struggle to top 70 degrees for a high Washington DC may enjoy a day of only 88 to 90, rather than 100. It doesn’t appear as though this eastern trough, eases the heat much south of Tennessee with likely daytime 90s remaining for Atlanta, though we may see a day midweek of 89 there but if so, it will be short lived I believe. Folks south of Atlanta will see highs remain in the 93-93 range day after day and nights continue to struggle out of the 80s for lows. A generally overcast, showery day with some of those showers very heavy… A mild day but with minimal sunshine.